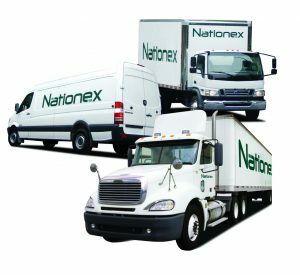 Throughout Quebec and Southern Ontario, Nationex delivers most of your parcels the following business day. With our 3 sorting centers as well as 14 facilities, we are able to carry your parcels overnight to their final destination in order to ensure a next day delivery or a very short transit time. As per the rest of Canada, our standard ground delivery will offer you a great level of service as well. Whether it is for a C.O.D. payment, dangerous goods transportation, freeze protection or additional insurance, Nationex is able to provide you with added value services at a very low cost. Nationex aims to be the prefered courier of distributors and manufacturers located in Ontario and Quebec. With strategically located sorting facilities in Ontario and Quebec, together with its reliable partners in Western Canada as well as the Maritimes. Nationex is proud to deliver parcels from coast to coast. More than 300 of our trucks (from various size vans to full size trailers) are on the road everywhere throughout Canada. Thanks to fully-automated, state-of-the-art computer technology, your parcels are quickly sorted and accurately routed to their final destination. Easy and reliable on-line tracking. Our shipping software are made to be fast and reliable. However, we are able to adapt to almost any kind of technological platform in the transport industry. From complete ERP and warehouse management systems like SAP to transport management systems like Descartes, UFMS, Tecsys or Canlogix or e-commerce tools like Shopify our I.T. can connect to almost any electronic platform.